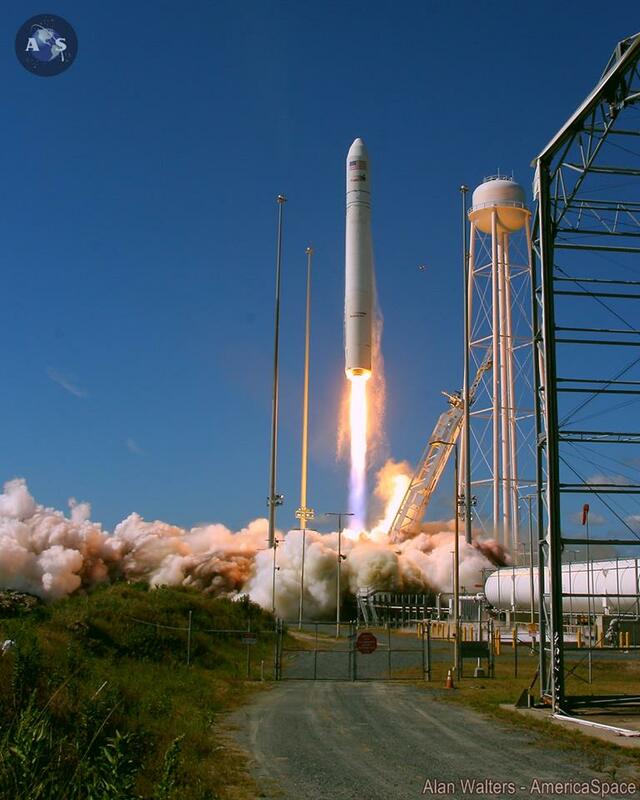 An ongoing engine failure investigation has forced Orbital Sciences to, for a second time, delay launch of their next Antares rocket on the company’s second contracted ISS resupply flight for NASA (Credits: Alan Walters / AmericaSpace). Orbital Sciences Corp. has again delayed the next scheduled launch of their Antares rocket on the company’s second NASA-contracted resupply flight to the International Space Station (ISS), pending the outcome of an ongoing investigation into why an Antares AJ26 engine scheduled to fly an ISS resupply flight next year failed during customary acceptance testing (also known as “hot-fire” testing) at NASA’s Stennis Space Center in Mississippi on May 22. The next mission, designated Orb-2, is now scheduled to fly from NASA’s Wallops Flight Facility MARS Pad-0A no earlier than July 1. That date is, however, only a planning date to give engineers more time to determine the cause of May’s engine failure; a new firm date will not be established until more progress is made by the investigation team. It’s important to note that the engines themselves, built by Kuznetsov Design Bureau, are 40 years old, and they are no longer in production. Aerojet purchased 40 of the engines in the 1990s and can supply enough to Orbital to support Orbital’s contractual obligation for ISS resupply flights for NASA, for now, but without a replacement engine the Antares may not survive to fly into the next decade. In an effort to secure future exclusive business with Antares Aerojet president William Boley offered to restart engine production with Kuztnetsov last year, with the goal of producing four to six new engines annually in time to support NASA’s future CRS-2 contract (delivery of the new engines would need to start in 2016 to support that). How those talks have gone in the time since is unclear at this time. 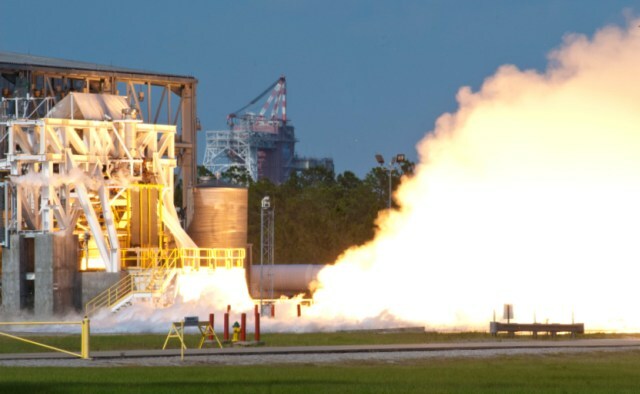 An AJ26 is test fired at NASA’s Stennis Space Center (Credits: Orbital). The only current alternative to launch the Antares is the controversial Russian-made RD-180 engine United Launch Alliance (ULA) currently uses on their Atlas-V rockets. However, ULA holds exclusive rights in the U.S. to buy the RD-180 and has a reputation for anticompetitive practices, and Orbital’s requests for support from the Air Force, Office of the Secretary of Defense, and Congress were all met with roadblocks and silence. Other possible alternatives include the RD-181, RD-191, and RD-193, but those are either still in development or not yet approved for export (the RD-191 is being developed for Russia’s Angara rocket). Although no more information is available from Orbital at this time, it is safe to assume that Antares will not fly until the investigation determines the cause of the failure in May, or at least determines it was not a manufacturing or mechanical defect. The engines on the Antares rocket currently waiting to fly the next ISS resupply mission went through the same mandatory testing some time ago to ensure nominal performance and acceptance for use. Both engines (Antares requires two AJ26s) passed with flying colors. When ready, Orbital will launch Antares from the Mid-Atlantic Regional Spaceport at NASA’s Wallops Flight Facility in Virginia to deliver over 3,600 pounds of cargo and supplies to the ISS with their unmanned Cygnus spacecraft—the second of eight such scheduled flights for Orbital under a $1.9 billion Commercial Resupply Services (CRS) contract with NASA. Cygnus will remain at the ISS for 40 days before burning up in the Earth’s atmosphere with over 3,500 pounds of garbage. The mission will also mark the third ISS flight for Orbital and the fourth flight of their Antares rocket (third flight for Cygnus). AmericaSpace will provide full on-site coverage of the launch when it occurs.